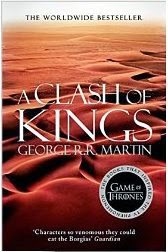 I have to say, these new paperback covers for George R. R. Martin's A Song of Ice and Fire series, with the generic landscape photos, are a bit dull; but the one for the second book, A Clash of Kings, is also a bit of a mismatched one, as the desert it shows is obviously meant to link to Daenerys' story, but she doesn't actually appear in this part of the story much, with only four or five chapters from her POV. What's actually going on in this novel is a fight for the throne that she's not quite ready to join yet, as Robb Stark and both Stannis and Renly Baratheon all stake their claim to the throne that Joffrey, not actually the dead king Robert's son, is falsely sitting on. Again I enjoyed reading the story I'd seen on TV, as well as seeing those areas where the two versions started to diverge, the TV version understandably having simplified certain elements. The next installment is one of those so long it got split into two volumes, so I'm taking a break now to read other things, but I'll probably be heading back to Westeros in the new year.